. . . My friend, the late Max H. Gaebler, tells a story of the early days  of a brewery located north of the city limits between sixty and seventy years ago. Bad as was the beer, the drinkers of that day made liberal concessions, but they balked at the worst kind so that where it was undrinkable the brewer fed it to his hogs on the farm. When the brewer's hogs lay on their backs pawing the air and squealing in riotous glee the passing pioneer farmers patiently driving their oxen to town knew that another brew had miscarried. The brewery went bankrupt and its principal asset, a thirty five gallon copper kettle, came into possession of Joe Miller, the local coppersmith. In 1861 an orchestra was formed in Watertown to assist the choral society in performing Haydn's “Creation.” Kettledrums were quite necessary but not available. So E. C. Gaebler, the conductor, commissioned Miller to build a pair. Miller utilized the old brewing kettle for the body of the larger one and it was a success. Eventually the drums were sold to a musical society in La Crosse where they were long in service. When the good people of La Crosse listened to the sonorous roll of the kettledrum, little did they suspect its turbulent origin . . . Wisconsin Magazine of History, Volume 4, 1921, “Chronicles of Early Watertown” by William F. Whyte. Hans Gaebler of Seattle, son of Max Gaebler of this city, sailed from Seattle last week on the steamer Kamakura Mera for Japan, where he will pass his vacation. Max H. Gaebler, Candidate for Mayor. Because of the insistent solicitation of prominent businessmen I am a candidate for the office of mayor at the election on April 7. If elected, I enter the incumbent duties free of promises or political debts. My business experience, and the fact of my being a large taxpayer, suggest careful scrutiny of municipal expenditures and commitments. My personal character, established through a lifetime residence in this city, should be a guarantee for right dealing. Your votes are respectfully solicited. Max Henry Gaebler, a prominent and highly esteemed resident of Watertown and secretary and treasurer of the Watertown Table Slide Company, died this morning in his late residence, 309 Fifth Street. He had been in failing health for several weeks past but had so far recovered as to be able to be out the early part of the week but suffered a relapse which ended in death. Mr. Gaebler was born in Danbury, Conn. September 27, 1851. He came of distinguished ancestry on both the paternal and maternal sides. He came here with his parents in 1859, where his father, Emil C. Gaebler, engaged in the building of organs and the teaching of music. The son received his early education at home under the instruction of his grandfather and had read many of the German classics before he was twelve years old. His studies were continued in the local high school, under the late Prof. Bernard and he was one of the first three students to enter Northwestern College. He also received an excellent musical education. In his early life he assisted his father in the construction of musical instruments and also aided in the conduct of the music store. He acquired technical skill in piano tuning and since 1870 devoted a great share of his time to this art and gained a statewide reputation for extraordinary skill. In 1889 he helped in founding the Watertown Table Slide Co., and gradually withdrew from the other avocations and since the founding of the company has been its secretary and treasurer and designed a great share of the special machinery used in the plant. He was united in wedlock on March 24, 1886 to Bertha Blumenfeld, daughter of the late D. Blumenfeld, who preceded him in death April 6, 1908. He is survived by one son, Hans D. Gaebler. He is also survived by two brothers, Arthur Gaebler, Chicago, Otto Gaebler, Milwaukee and one sister, Miss Sophie Gaebler, Milwaukee. Mr. Gaebler was a republican in politics and he was a candidate for mayor in 1914, and although defeated for the office received a strong endorsement in his home ward and a large vote throughout the city. He never aspired to public office and on this occasion was induced by his friends to make the run. It is also true of other positions of responsibility and trust which he capably filled. He served as a member of the Jefferson county board of supervisors several terms being elected in a democratic ward from 1881 off and on until 1911. He was a charter member of Watertown Lodge No. 666 B. P. O. Elks and a member of Lincoln Lodge No. 20, Knights of Pythias. He was a lifelong lover and student of music and for many years served as musical director of the Concordia Musical Society. He was also in his early life an accomplished pianist and violinist. He was a great reader of current literature and was one of the most intelligent and best informed men in this section of the state. He possessed an affable disposition and a genial nature which drew to him many warm friends wherever he was known. His home life was all that could be desired in a father and husband. 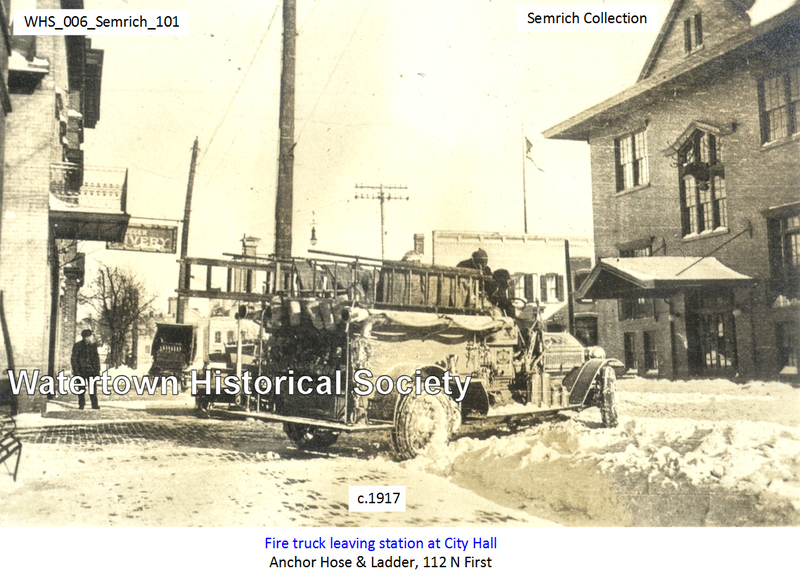 He took an active interest in all that concerned the industrial life and growth of Watertown and was always ready to lend a helping hand for anything conducive to that end. Watertown loses a good citizen in the death of Mr. Gaebler, a type of the forceful, self reliant man. He was a man of liberal tastes and cultivation and possessed a fund of diversified information. Mr. Gaebler had a marked social gift and was always a welcome addition to the social life of Watertown. His engaging personality and address bespoke confidence and a liking shared in by the whole community. His nature was of the sterling kind which bespeaks confidence and wins and keeps friends. The funeral will take place on next Tuesday afternoon with services in the family home at 2 o’clock. The burial will be in Oak Hill cemetery. Hans D. Gaebler was named president of the Watertown Historical Society by the board of directors of the organization following the annual meeting of the society last night. Both meetings were held at the Octagon House of Will Thomas, retiring president who did not desire re-election. Other officers are: Miss Ella Wilder, first vice president; Dr. O. E. Meyer, second vice president; John D. Clifford, third vice president; Miss Gladys Mollart, secretary, Miss Claire Herrmann, treasurer, and Will Thomas, custodian. The above officers, together with Miss Jennie Lord and J. E. McAdams, constitute the board of directors. Directors re-elected last night were Miss Herrmann and Miss Wilder. Dr. Meyer succeeded Attorney E. F. Wieman, who declined re-election. The board of directors extended Mr. Thomas a vote of thanks for the services he rendered the organization as president during the past year. Masonic funeral services for H. D. Gaebler, former Watertown resident who died at Wood, Wis., yesterday, will be conducted here on Monday afternoon at 2:30 o’clock at the Nowack Funeral home, after which the body will be taken to Milwaukee for cremation and the ashes will be returned here for interment in Oak Hill Cemetery at a later date. Friends may call at the funeral home to pay their respects after 3 p.m. Sunday and also on Monday until the service time. Mr. Gaebler died after a lengthy illness, having been hospitalized at the Veterans’ hospital in Wood for some time. He was born in Watertown on Dec. 21, 1886, a son of Max D. Gaebler and Bertha Blumenfeld Gaebler and spent the major portion of his life in Watertown. He was a graduate of Northwestern College and the University of Wisconsin, holding his A.B. and M.A. degrees from that institution. For a number of years Mr. Gaebler served as law librarian of the University of Chicago. At one time he was active in Watertown business circles and was president of the Watertown Table Slide Co., which had been founded by his father and the late Emil Schultz. He and his family moved from Watertown some years ago. At the time of his retirement in 1949, due to ill health, Mr. Gaebler was librarian at the quartermaster depot in Chicago. For several years prior to taking the quartermaster position, Mr. Gaebler was translator of Nazi documents seized in World War II, and was stationed at Wright Field, Dayton, O. At one time he also taught German in several schools, including the University of Washington in Seattle. Mr. Gaebler had a wide variety of interests and his studies in astronomy covered many years. He was a life member of the American Association of Variable Star Observers. In Watertown he served for a number of years on the executive council of the Potawatomi area council, Boy Scouts of America. His interests in scouting was one of his outstanding traits and he gave many hours of service and time to local Boy Scout work, especially in the fields of astronomy and canoeing. He was the first president of the Watertown Parent-Teacher association and was for a number of years on the board of library commissioners here. He was one of the founders of the Watertown Historical Society and was a member of the Masonic order in Watertown. At one time he was also associated with the Watertown Rotary club and numerous other local groups. He was a member of the American Legion by reason of his World War I service. Mr. Graebler is survived by his wife, the former Helen C. Beebe whom he married in Kankakee, Ill., on June 17, 1920, and two sons, the Rev. Max David Gaebler, Davenport, Ia., where he is a pastor of the Unitarian church, and Lt. (j.g.) Ralph Dixon Gaebler, a staff member stationed on the SS Ajax at Yokosuka, Japan. Other survivors include a grandson, David Bryson Gaebler; and uncle; Dr. Arthur Gaebler, St. Petersburg, Fla., and an aunt, Miss Sophie Gaebler, well-known Milwaukee pianist who was a pupil of the great Hungarian composer, Franz Liszt. During his years in Watertown, Mr. Gaebler contributed much to the betterment of the community. He was interested in everything that went to make this a better city and supported movements that worked toward that end. He was especially interested in young people and their future as good citizens. In any list of men and women who have contributed much to the betterment and progress of Watertown as a community of homes and family life the name of H.D. Gaebler must definitely be included. He did much that was worthwhile and those who knew him best will always remember him for it. 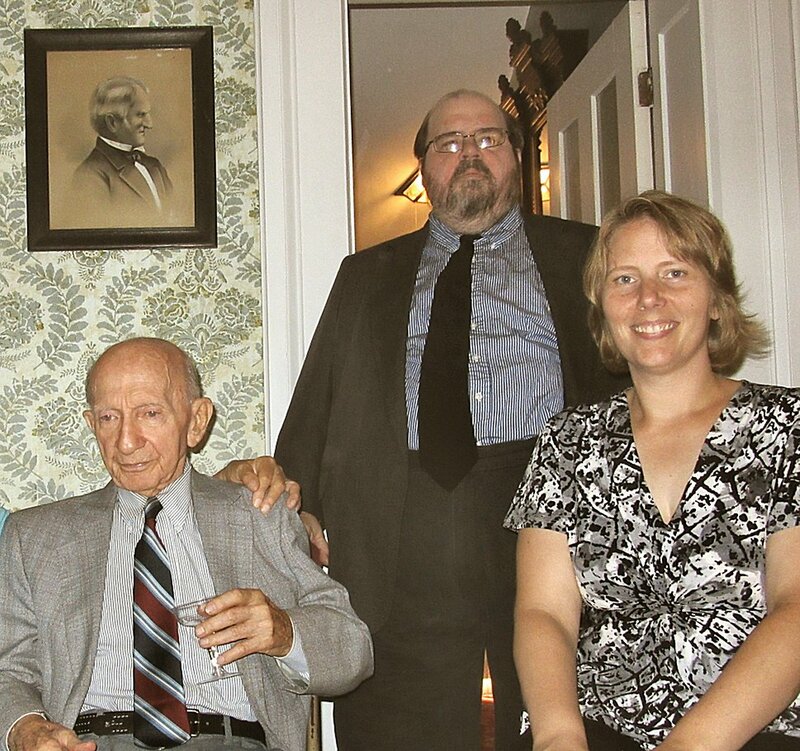 The Watertown Historical Society hosted a very special 90th birthday party for the son of its founder on Saturday, September 5. The honoree was Ralph Gaebler, of Milwaukee, a former owner of a chain of gas and oil stations in the Milwaukee area. The event was held in the famed Octagon House Museum. About 15 family members and friends of the family gathered to honor the spry 90 year old who regaled the company with stories of his youth in Watertown. Also on hand were: William F. Jannke, former president of the society who delivered a talk on the importance of the Gaebler family in the founding of the Watertown Historical Society, Melissa Lampe, current president, who welcomed the guests, David Hertel, himself a former president of the society, who gave a special tour of the museum to the assembled guests, and Ken Riedl, who is not only a member of the board of directors of the historical society but also serves as the society’s webmaster. 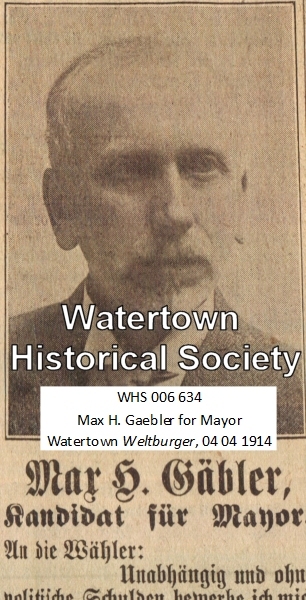 The Gaebler family has a long history in Watertown. Mr. Gaebler’s great grandfather was Emil C. Gaebler, who came to the city in the 1850s and owned and operated an organ and melodeon store on N. Fourth Street, in the former WEPCO Printing building. He also founded the Concordia Opera Society here, one of the finest musical societies in Wisconsin in the nineteenth century. Ralph’s grandfather was Max Henry Gaebler, who was one of the founders of the Watertown Table Slide Co., one of the leading industries in Watertown for many years. 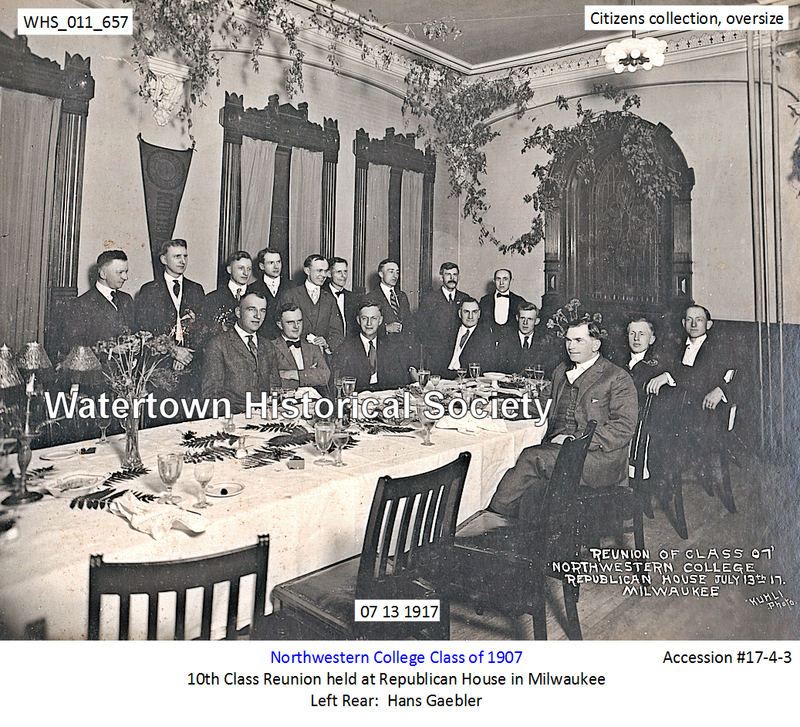 Mr. Gaebler’s father was Hans D. Gaebler, who at various points in his life was a school teacher, a law librarian, an official with the Watertown Table Slide Co., and an astronomer. 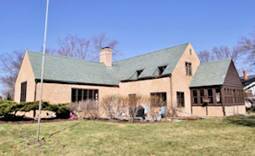 Hans Gaebler founded the Watertown Historical Society in the front room of his former Tudor-style home on Thomas Avenue in 1933. 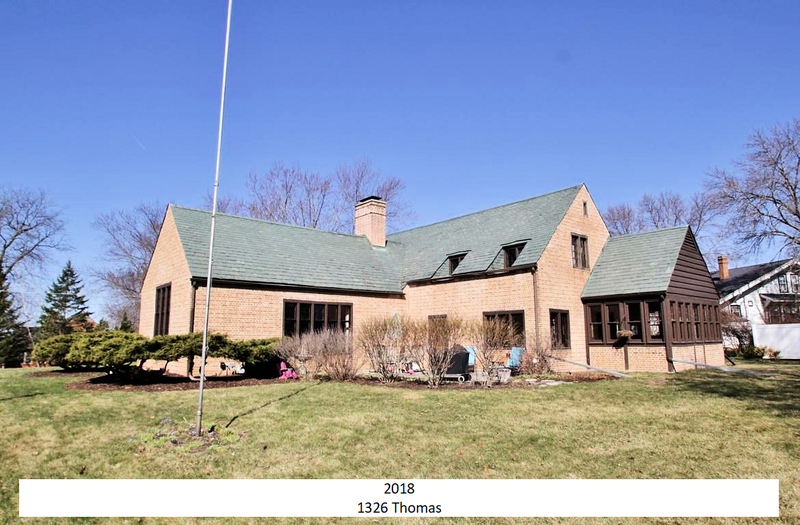 He went on to serve as the society’s president from 1936 to 1938 and during his tenure as president he oversaw the acquisition of the famed Octagon House and in 1941 started the movement to acquire the famed First Kindergarten building.